Reinette et Mirabelle are best known in the dolly kei world for their bottled butterfly necklaces, resin "jewel" butterfly rings and earrings. More than likely if you've admired a snap of the Grimoire staff, they're sporting one of their offerings. 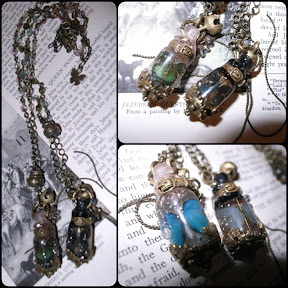 Firstly, a rendition of their bottle necklaces, only much smaller and with less "bulk" added to it. The chain is also much more delicate, and metal trim and details have been added to the bottom and around the neck of the bottles. I really love these new versions! 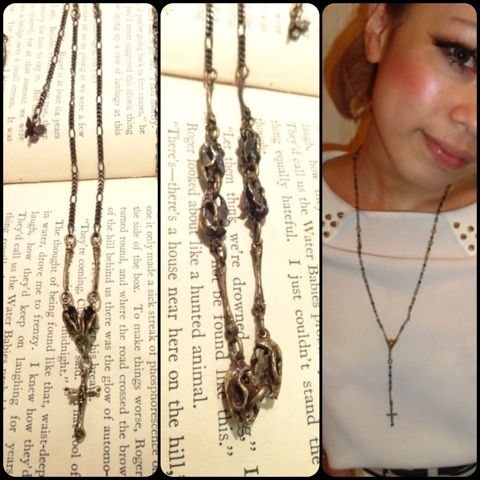 Secondly, a sort of "rosary" style necklace. These are gorgeous. I love how old and worn they look, with a little bit of "darkness". 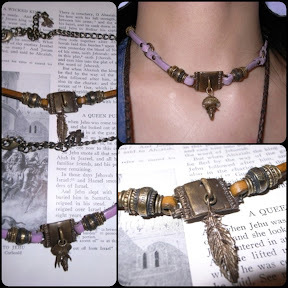 Probably straying the farthest from their usual items, these leather choker-style necklaces. No resin, no butterflies, just metal findings. Not my style at all, but the dinosaur is kind of quirky and cute though! *all photos from the Grimoire blog, collaged by myself. I loved the bottles necklaces!! Me too! I want one so badly!